Featuring: Vincent Price, Agnes Moorehead. Director: Crane Wilbur. Well, the time has come for my annual Vincent Price marathon. Nothing gets me in the Halloween spirit more than the man with the creepiest voice in history. 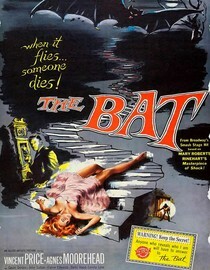 First up was the murder mystery, The Bat. One million dollars has turned up missing and there is a murderer on the prowl looking for the stolen loot. If it wasn't for the killer dressing up like a bat (who ironically has a costume that reminds me more of Catwoman), this would be your standard whodunit murder mystery. And that's not a bad thing, I love old school mysteries like this and with Vincent Price in the lead you can't really go wrong. I enjoyed this one, there were just enough twists and turns to keep it from getting boring. If you like murder mysteries and/or Vincent Price, then give this one a try. According to Netflix this movie will stop streaming on 3/15/13. Of course, sometimes they lie. Why is it in your queue? All available Vincent Price movies are in my queue. Is it artsy? No, classic mystery. What stood out the most to you? Vincent Price and a couple of the twists (which I won't mention). What mood should I be in to watch this movie? Looking to solve a mystery. I figured it out before the movie explained it, but I still enjoyed the ride.